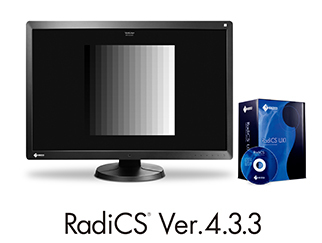 Hakusan, Japan, December 10, 2014 – EIZO Corporation (TSE: 6737) today announced that the latest version of its RadiCS monitor quality control software now complies with the newest standard set forth by the German Institute for Standardization (DIN), expected to become mandatory in spring of 2015. With the transition from analog to digital imaging in the medical field, it is necessary to implement quality control (hereafter QC) standards and guidelines to ensure medical images are displayed with optimal accuracy. Germany’s current standard, DIN V 6868-57, has specified the criteria for fulfilling optimal QC conditions to maintain quality assurance for diagnostic precision in digital imaging. The continuing advancement of diagnostic technology, including the transition from CRT to LCD monitors, has furthered the demand for reliable image support across various modalities. As a result, the latest standard, DIN 6868-157, pushes a higher level of criteria incorporating new test items and methods. EIZO’s RadiCS QC software version 4.3.3 complies with the standards set forth by DIN 6868-157 to provide medical facilities with continued efficiency in monitor QC maintenance for supporting a variety of medical imaging modalities. Extensive manufacturing expertise in visual display technology for the medical field combined with the opportunity to participate in public review of the new standard has allowed EIZO to support DIN 6868-157 promptly after its publication. This ensures that medical facilities that have RadiCS 4.3.3 installed are provided with optimal support during the transition to the new DIN in 2015. “EIZO welcomes the challenge to address the increasing demand of high-level standards for visual solutions in any mission-critical market, especially medical imaging. Such high-reach targets demanded by DIN 6868-157 are in the best interest of the constantly advancing field of medical technology and EIZO is proud to contribute to the development of this new standard,” comments Kazuhide Shimura, board member and general manager of EIZO Product Business Development. EIZO (TSE:6737), which means image in Japanese, is a visual technology company that develops and manufactures high-end display solutions. EIZO integrates hardware and software technologies with consulting, web hosting, and other services to help customers in business, graphics, gaming, medicine, maritime, and other fields work more comfortably, efficiently, and creatively. Headquartered in Hakusan, Japan, EIZO has R&D and manufacturing facilities in Japan, China, Germany, and the US, and representation in more than 70 countries.